If you were starting to get a bit too comfortable with our above seasonal temperatures the past week, Mother Nature slapped some sense into you when you woke up Friday morning. What began as flurries late Thursday afternoon turned into another blast of winter, proving we aren’t out of the woods just yet. High winds and snow walloped southern Manitoba, closing several highways in the province Thursday night, which only began to reopen just a few hours ago. Among the major highway closures was Highway 1 west from Winnipeg to Brandon, and Highway 75 from Winnipeg to the U.S. border. Both have since reopened as the winds diminished, but the roads are still quite slippery according to Manitoba Highways. When you look at the data, it doesn’t appear the storm was that bad. Environment Canada reported only 3.5 centimetres of the white stuff fell in the city, but with the wind, it appeared to be in the 10-15 centimetre range in some places. The wind even caused Winnipeg police to issue a warning to motorists on Thursday about avoiding part of Sturgeon Road, due to impassable conditions in open areas. Thankfully, the snow has tapered off and we should reach a high of -15°C today with sunny skies. The winds will settle to about 10 km/h by this evening, making it a bit more bearable to be outside during the Festival du Voyageur kickoff party. Saturday is calling for a high of -16°C with scattered flurries and north winds gusting up to 10 km/h. 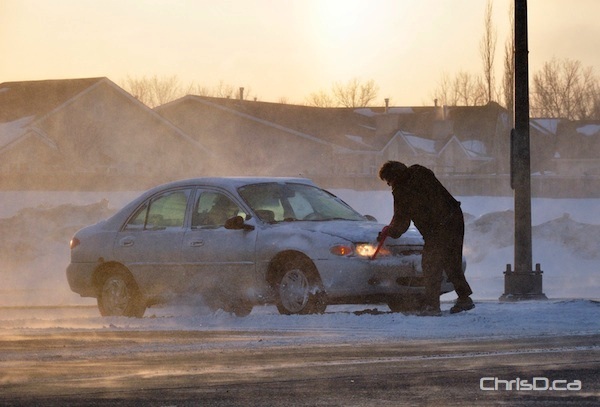 UPDATE: The City of Winnipeg has started to plow major routes, accompanied by sanding trucks. Plowing will shift to bus routes and collector streets after main routes are completed. Areas where drifts have made roads impassable will also be addressed. About 150 pieces of equipment will be used at a cost of approximately $500,000.